Performers include: Jack Klugman, Garry Walberg, Robert Ito, John S. Ragin, Val Bisoglio, Joseph Roman, Eddie Garrett, Marc Scott Taylor, Peter Virgo, Diane Markoff, Anita Gillette, and John Nolan. Series Description: Dr. R. Quincy (Jack Klugman) gives up his lucrative private practice as a surgeon after his wife Helen dies from a brain tumor. He joins the County of Los Angeles’ Coroner’s Office as a Medical Examiner (M.E.). In his position, Quincy uses forensic medicine to determine a deceased person’s cause of death. Through his expertise, and with the help of fellow examiner Sam Fujiyama (Robert Ito), he sometimes uncovers details that indicate that a seemingly natural death was actually a murder. Not content to merely stay in the lab, Quincy often ventures out into the field on a crusade to gather evidence to prove his findings. This is a source of constant frustration to others, including Lieutenant Frank Monahan (Garry Walberg), Sergeant Brill (Joseph Roman), and Dr. Robert Astin (John S. Ragin), Quincy’s arrogant superior. All of this extra activity doesn’t bode well for “Quince’s” love life with regular girlfriend Lee Potter (Lynette Mettey) or later, psychiatrist Dr. Emily Hanover (Anita Gillette). When he does finally take a break, Quincy can be found spending time at Danny’s, a bar located near his houseboat. Kenny Kelso (Paul Rudd), a dock worker and young father, is seriously injured when a stack of metal piping falls on him and severs his arm. 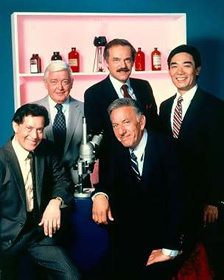 Quincy (Jack Klugman) and crime scene photographer Eddie (Eddie Garrett) are nearby and Quincy helps to stabilize Kenny until paramedics arrive. His arm is found and Kenny and his limb are transported to Las Manos Medical Center. Dr. Gabriel McCracken (Barry Newman) runs a program called Experiment Hope which is made up of devoted doctors who use new technology to find solutions to otherwise hopeless cases. Kenny’s arm is reattached but surgery complications cause him to lose the use of his other arm. Together, McCracken and his staff work to find a way to help Kenny lead a better quality of life. • The series finale is not a typical episode of the series. There’s very little focus on Quincy and many of the show’s regular characters are missing altogether. The episode was actually intended as a pilot for a spin-off series called The Cutting Edge. Had the series been picked-up, it would have focused on the hospital and its staff, helping people that others could not. Emily (Quincy’s wife since episode 141) is featured prominently in the episode and would have been a regular on the spin-off series. Cutting Edge did not become a series and viewers were cheated out of a fitting series finale. • The series began as four 90-minute movies as part of a rotation of mystery movies for the NBC Mystery Movie. They performed well so NBC made Quincy a regular sixty minute series the following year. • Anita Gillette once played Quincy’s deceased wife Helen in a brief flashback. The producers must have felt the actors had good chemistry because Gillette returned years later to play Quincy’s girlfriend (and eventual second wife) Doctor Emily Hanover. Another thing I noticed. In season 7, there was a stock shot of the coroner’s wagon, (parked a bit screwy, too). The Matador from the early years, after he had moved up to a Ford. I suppose there was a fleet of them, but…I like watching these old shows, just to see what cars of the time I recognize. 1: In most of the shows, Quincy gives details in metric, but at lease one has SAE. Scriptwriters booboo? 2: After their marriage, no one referred to her as “Mrs. Quincy”, not even Quincy himself. Anyone else notice this? Quincy M.E, was a great show and Jack Klugman was a wonderful actor. Sorry to have seen the series vanish. I LOVED THIS SHOW SO MUCH!! I HATE TO SEE THE SHOW GO. I WATCH IT ON ME-TV AS MUCH AS I CAN FIND IT. I WISH I HAD THE MONEY TO PUT THE SHOW BACK ON TV. WISH THE SHOW WAS BACK ON ME-TV. I AM A DAILY WATCHER. I LOVE ALL THE CAST. SO MANY MEMORIES. I luv QUINCY! & there is “NO” Channel (I get about 650 Channels) that airs him.? Whynot? Sorry if this offends fans of the show, but I just never could stomach it. Too preachy & goody two shoes for me. Klugman was great as Oscar Madison, but as a show, Quincy just took itself too seriously. When I watch TV, I want to be entertained, not lectured about morality or preached at about current social issues. The Original Poster of the Quincy Story above made a mistake, he stated that Ann Gillette played Quincy’s diseased wife and then later payed his new Wife Dr. Hanover. That was wrong, Ann Gillette was in Law and Order and she is quite young. It was Anita Gillette who played in Quincy. I would like to know if anyone knows how I would obtain, a copy of Quincy ME, that aired around 1986, Starring Anne Margrett as a pregnant, ill woman? At the end of the show my niece was the infant used as her newborn daughter. We would like to show her children and other family members this episode. All of Quincy ME episodes are on Netflix. I hope that helps. what was Quinceys first name. @kelly: As the article says, it was never revealed. We do know that it began with an “R.” A fun bit of trivia about the series!